Akio Takamori (Japanese-American, 1950-2017). Blue Woman, 2014. Mold-blown glass with oil paint; ceramic base; 10 1/2 × 8 1/2 × 9 1/2 in. Courtesy of James Harris Gallery. The career of artist Akio Takamori (Japanese-American, 1950-2017) spanned over 40 years, during which time he became a well-known influencer of contemporary ceramics. He was a professor at University of Washington for over 20 years and helped build a ceramics program which became highly-sought after by art students nationwide. Takamori’s work was heavily inspired by his Japanese heritage, as well as historical movements in art and cultural events. His artistic career pushed the boundaries of traditional industrial pottery, ceramic slab vessels, and larger-than-life public art commissions. 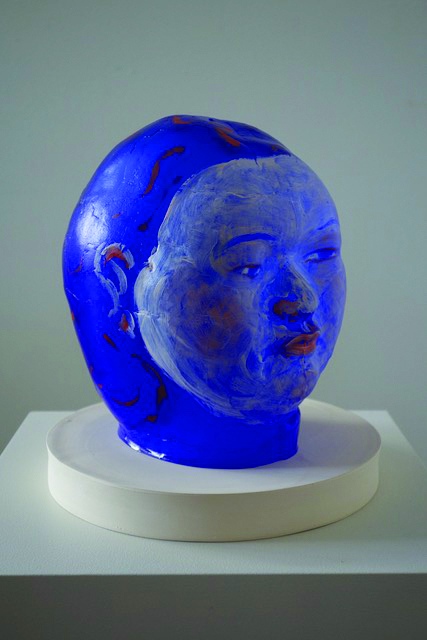 In August 2014, Takamori completed a Visiting Artist Residency at Museum of Glass, during which he created work inspired by head-shaped ancient Roman glass flasks. These flasks, popular during the 2nd and 3rd century AD, were created by using molds to shape the glass. This technique, using his ceramic sculptures as the basis for the glass molds, allowed Takamori to bring his expertise in ceramics to the creation of glass sculptures. Each glass piece is also embellished with enamel paints, creating a pictorial surface which plays with the transparency and opacity of the glass. In honor of his Grand Prize Coney Award from the 2016 Red Hot Auction and Gala, and in celebration of his life and continually innovative career, Museum of Glass presented a selective display in the Grand Hall, which included examples from his residency in the Hot Shop. Organized by Museum of Glass and Vicki Takamori. Thank you for signing up to receive news and important information about Museum of Glass. All proceeds support educational and community programming at Museum of Glass.